Think back a moment to your mid-20s: you were likely just settling into postgrad life, landing your first adult job, and trying to balance fun nights out with paying back your student loans. Or maybe you're in your mid-20s right now, trying to navigate the world after college, on the prowl for a significant other, and trying to balance your desire to travel the world with the responsibility of paying rent on time. Imagine at that time having the responsibility of running a country - wait, more like four countries - placed on your shoulders. That's exactly what happened to Queen Elizabeth II in 1952 when her father, King George VI, died and she was appointed to the throne. At the time, she was only 25 years old - a 25-year-old woman who, for all intents and purposes, was not expected to become queen; Elizabeth's uncle, Prince Edward, inherited the throne from King George V, and many assumed he would marry and have children of his own (that would knock Elizabeth down the line of succession). But in 1936, when Elizabeth was just 10, Edward abdicated the throne to marry his divorced mistress, American socialite Wallis Simpson, and George VI took over. For the first 10 years of her life, Elizabeth would have been just like today's Princess Beatrice: a distant heir to the throne. Nobody predicted that George would fall ill and pass away so soon - he was only 56 - but those royal duties quickly became hers. In early 1952, Elizabeth and Prince Philip, whom she had married four years earlier, set out for a tour of Australia and New Zealand with a stop in Kenya. While at their Kenyan home, Sagana Lodge, they got word that the king had died - and that Elizabeth was now queen. 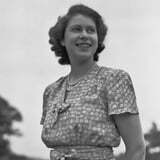 It was Prince Philip who broke the news to her, and when she was asked to choose a regnal name, she opted to "of course" remain Elizabeth. She and Prince Philip headed back to London and almost immediately moved into Buckingham Palace. In June 1953, Elizabeth was coronated at Westminster Abbey; Prince Charles and Princess Anne, who were just four and two at the time, respectively, were present for the big event. The Queen's Regalia - What Does It All Mean? Since taking the throne, Elizabeth has become head of the Commonwealth (which currently includes 52 countries) as well as queen of another 12 countries that have become independent since her accession. In 2015, she broke an astounding record, becoming the UK's longest reigning British monarch (the previous record of 23,226 days was held by Queen Victoria). She's celebrated huge milestones with her Silver, Golden, and Diamond Jubilees, and in 2017, she became the first British monarch to commemorate a Sapphire Jubilee, marking 65 years of her reign. Elizabeth is certainly not your average 92-year-old, but the duties and challenges she's taken on since becoming queen can still inspire all women - whether you're in the throes of your 20s right now or looking back on those heady days with fondness.